Chapala, now the unprecedented 23rd category 4 or category 5 tropical cyclone to form during 2015, is bearing down on the nation of Yemen. A nation that is likely to experience hurricane force winds and may receive as much as 8 years worth of rainfall from Chapala’s intense spiral bands over a 24-48 hour period. After a rapid bombification on Friday, Cyclone Chapala became the most intense storm on record to form so far south in the Indian Ocean. Like Patricia, this storm gathered strength in waters that were much hotter than normal (+1 to +2 C above average for the region). Like Patricia, the storm rapidly intensified in a single 24 hour period — gaining 90 mph of wind intensity in just one day. And like the 5 billion dollar weather event that was Patricia, Chapala threatens severe damage along its likely land-falling path. A hothouse storm for a hothouse world that in 2015 has seen the previous record for the rate of formation of the most intense tropical cyclones shattered by five storms so far this year. The previous record, set in 2004 was for 18 such storms over a one year period. Now, the new record is 23 and counting. Chapala is expected to track west-by-northwest, weakening to a category 1 or 2 storm just before making landfall in Yemen on Monday. At that point the storm is predicted to dump as much as 12 to 16 inches of rain over parts of Yemen. If this happens as current weather models predict, parts of Yemen which typically receive less than 2 inches of rain per year may see as much as 8 years or more worth of rain fall over the course of a day or two. Large, powerful storms of this kind do not typically track into Yemen. And the predicted and possible rainfall amounts would almost certainly shatter all-time records for the arid state. A potential event that Dr. Jeff Masters over at WeatherUnderground yesterday called unprecedented. Such heavy rains would hit a region that is not at all equipped for dealing with so much water falling from the skies. Dry lands that form a hard baked surface will tend to enhance pooling and run-off. Regions that typically see extreme flooding from just 1 or 2 inches of rainfall could see 5 to 10 times as much. Needless to say, this is a developing and dangerous situation that bears careful monitoring. 2015 will close out as the hottest year in the 135 year climate record. It will hit temperatures, globally, about 1.1 to 1.2 C hotter than 1880s averages. This extreme temperature departure, is nearly 1/3 of the difference between 1880 and the last ice age — but on the side of hot. An extreme heating that is starting to force the glaciers of the world to rapidly melt, the seas to rapidly rise, the oceans to rapidly decline in health, and climates around the world to rapidly destabilize. The oceans of the world draw in more than 90 percent of this excess heat energy. The added energy at the ocean surface, in its turn, provides more fuel for the most intense category 4 and category 5 tropical cyclones. 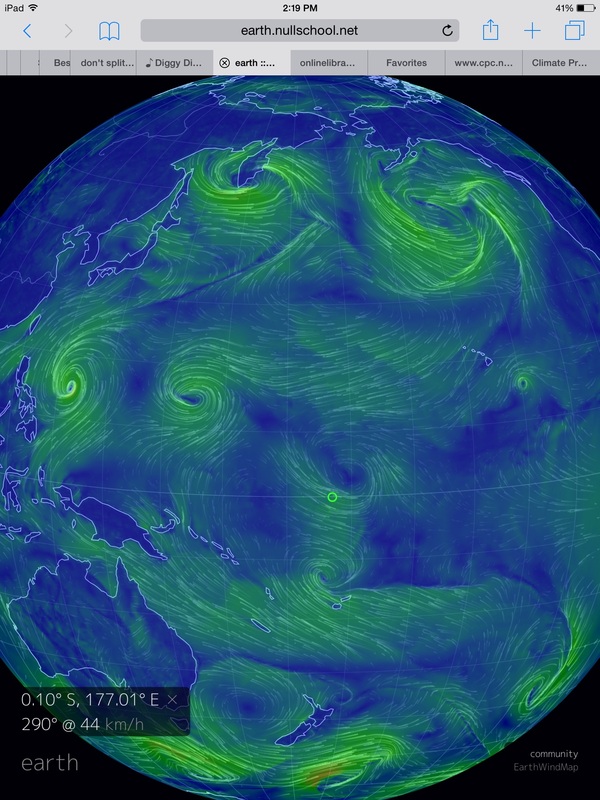 These storms draw their energy directly from heat and moisture at the ocean surface. 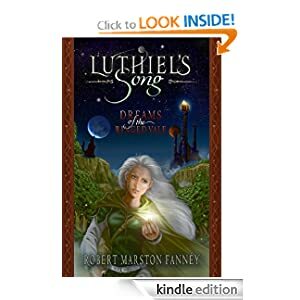 So as we, through our burning of fossil fuels and emitting of greenhouse gasses which in turn warms the climate, are unwittingly both increasing the frequency of strong storms as well as adding to their maximum potential energy. During recent years, we have seen greater and greater numbers of the most intense versions of these storms globally. During 2004 a new record number for category 4 and 5 cyclones was breached, only to be supplanted this year with the formation, so far, of 23 of these monster cyclones. In addition, the number of records for most intense storms for regions seems to be falling at an increasing rate. 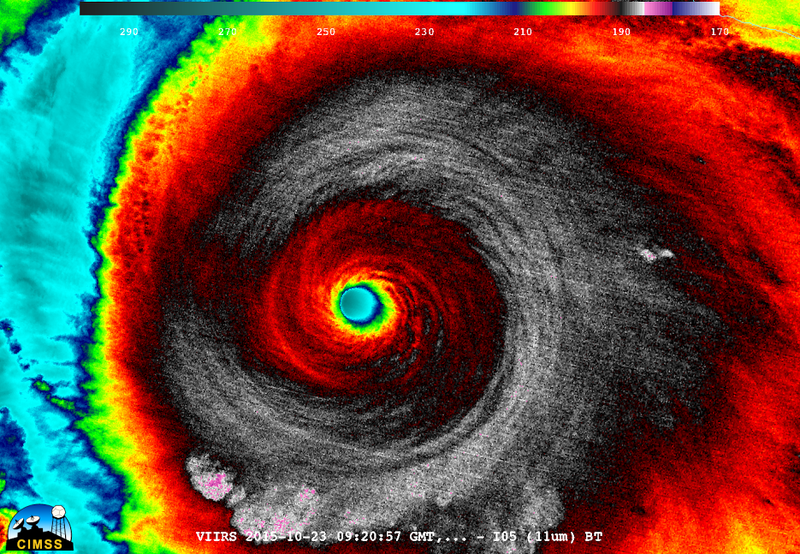 In 2013, cyclone Haiyan, roared into the record books as one of the most intense storms the world had ever seen. And this year we have two basin records — Patricia (Western Hemisphere) and Chapala (strongest to form so far south in the Indian Ocean). The human hothouse, thus appears to be providing more storms of high intensity. And with more warming in store — with nations, corporations, and politicians continuing to fight to delay climate action, ever more dangerous storms are coming. It’s a world that’s adding more than 50 billion tons of carbon dioxide equivalent gasses to the atmosphere every single year. It’s a year where, according to Ralph Keeling, we are likely to never see atmospheric CO2 levels in the 300-399 parts per million range ever again in our lifetimes. And it’s a time when global temperatures are at their hottest ever recorded by human instruments — likely to hit a very dangerous range between 1 and 1.2 C hotter than 1880s averages during 2015 and 2016. This is the context we all live in today. A world that’s sweltering in a toxic atmospheric stew of human hothouse gas emissions. But underneath that heat-amplifying context, the traditional ebb and flow of natural variability still has its own set of influences. And this year, the warm side of natural variability — in what may become the strongest El Nino ever recorded — is coming back to haunt us with a vengeance. Forget the so called ‘2 C safe limit’ set by international government bodies for a moment and think about all the extreme weather, the droughts, the wildfires, the loss of access to water, the increasing rates of sea level rise, the increasing rates of glacial destabilization, and the rapid declines in ocean health that have all happened since 1997 — the previous worst El Nino year on record. Back then, atmospheric CO2 levels had just breached the 360 parts per million mark. And, in that year a powerful El Nino — the peak of the natural variability hot side — shoved global temperatures into the range of 0.85 C above 1880s averages. It was the strongest El Nino ever recorded in the modern age. And it was occurring in a climate in which greenhouse gas concentrations were the highest seen in about 1 million years. It was a confluence of forces that propelled the Earth toward a new, more violent climate state. One not seen for millennia and one that was increasingly outside the ice-age and inter-glacial norm in which human beings evolved and learned to flourish. Over the 2000s and early 2010s, despite a swing in atmospheric natural variability back toward ‘cool,’ negative PDO, conditions, global temperatures continued to climb. Greenhouse gasses were building up in the atmosphere at record rates. Rates about 6 times faster than during the Permian hothouse extinction event that wiped out 75 percent of life on land and more than 90 percent of life in the oceans. As a result, new global high temperature records were hit in 2005 and 2010 even as the oceans drew in a massive amount of atmospheric heat. Heat that, according to Dr, Kevin Trenberth, would again back up into the atmosphere as the natural limits for ocean heat uptake were eventually reached. 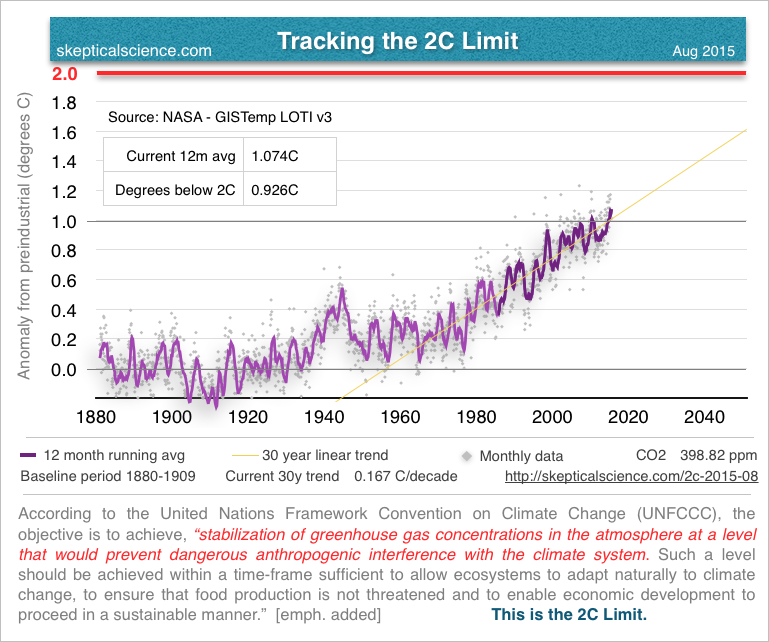 By 2014, as CO2 levels climbed into the 400 parts per million range and atmospheric heat uptake built, it appeared those limits had, indeed, been overwhelmed. Heat in the upper Equatorial Pacific Ocean began to spike as massive and powerful Kelvin Waves rippled across the world’s largest ocean, setting the stage for a new, monster El Nino. An El Nino that appeared to be building toward an event that would rival even the record 1997 El Nino. 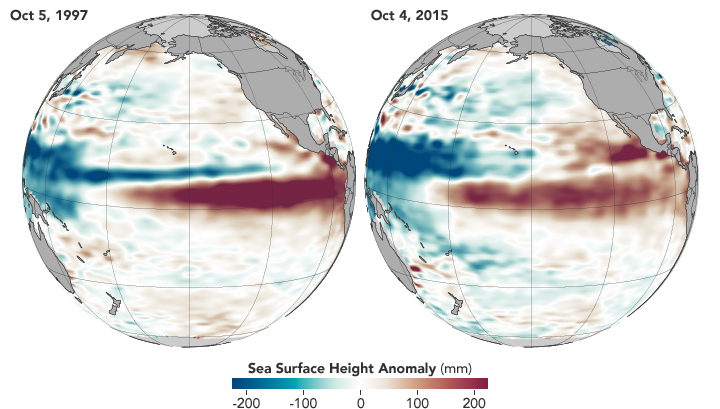 At first, the climb toward a record El Nino was slow. Even as ocean heat hit El Nino thresholds during the summer of 2014, the atmospheric response lagged — resulting in a steady climb into weak El Nino conditions through early 2015. Despite this slow advance, underlying conditions hinted at an extreme amount of available heat. The Oceanic hot pool was widespread and very intense — generating a heat bleed that pushed global atmospheric temperatures to new records for the year of 2014 and intensifying into 2015. By late Fall of 2015, atmospheric temperatures had rocketed into a range near 1.1 C above 1880s averages. But the top of the temperature spike was likely still to come. For throughout October El Nino continued to strengthen, reaching a new height of 2.5 C above average in the benchmark Nino 3.4 zone last week. This temperature spike is comparable to a record in the same region at 2.7 C above average for peak weekly values during the 1997 El Nino. Unfortunately, heat continues to build in this benchmark region of the Pacific. A rudimentary grid analysis of ocean models and readings for this week indicate daily measures in the range of 2.5 to 2.8 C above average. Daily measures that show a consistent warming trend. A trend that, if it continues, is likely to push Nino 3.4 temperatures into a range comparable with or exceeding the 1997 El Nino high temperature mark by early-to-mid November. In other words, the 2015 Monster El Nino event appears to be setting up to tie or beat the record-shattering 1997 El Nino over the next few weeks. Regardless of whether we see the 1997 record shattered, it is likely that heat bleeding off the current Monster El Nino will continue to amplify atmospheric temperatures on through early Spring of 2016. What this means is that we haven’t seen the hottest global temperatures out of this event yet. Preliminary estimates for October are coming in the range of 1.1 to 1.3 C+ above 1880s values. Meanwhile, a peak in atmospheric temperature is likely to occur within 1-4 months after El Nino itself peaks. So though 2015 has been a record breaker so far, we may see global heat intensifying through to 2016 with new monthly temperatures testing never before seen ranges. This added heat provided from a Monster El Nino makes it a distinct possibility that we will see three back-to-back record hot years — 2014, 2015, and 2016. 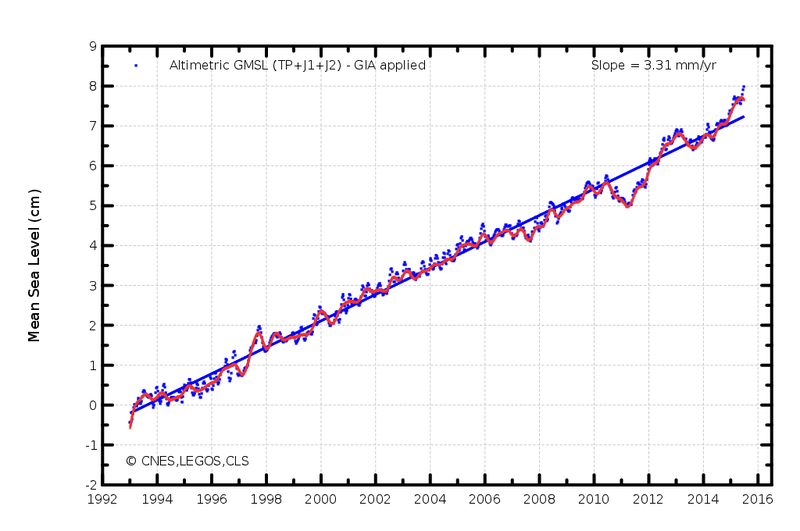 Is This the Last Year Below 400 ppm CO2? It’s official. In terms of economic damage and human displacement, the 2015 Indonesian wildfires are the worst that Island nation has ever experienced. Worse than even the terrible 1997 wildfires and possibly the worst wildfire disaster ever. And it’s all an upshot of what happens when slash and burn agriculture meets a once lush land now sweltering in a human hothouse world. There’s been something dreadfully wrong with Indonesia’s forests and peatlands ever since massive fires ignited across that island nation back in 1997. Back then, a monster El Nino — combined with heat from massive human greenhouse gas emissions — pushed the world to 0.7 to 0.8 C hotter than 1880s averages. Equatorial temperatures would never again fall to a normal threshold. And as the lands and surrounding oceans warmed, the dry season lengthened and the rainy season shortened. Slash and burn agriculture, a mainstay practice for the region ever since industrial farms began to take root there in the middle 20th Century, always generated some fires. But before human greenhouse emissions brought on added heat and dryness, the situation was one of slow degradation rather than violent conflagration. Even during the dry season, mid-to-late 20th Century moisture levels were much higher and fires tended to be naturally suppressed by the lush wetness of the region. But now, with the added heat of human warming creating droughts in the peatlands, slash and burn agriculture essentially amounted to throwing burning embers into a powder keg. As the heatwaves and droughts lengthened with amplifying human-forced warming, wildfires became endemic. Each year, the farmers burned more peatlands. Each year, the peatlands belched toxic smoke into the air, burning deeper and deeper into the carbon-rich ground, adding to and compounding the problem of human fossil fuel emissions and causing mass sickness and hospitalizations. In this dangerous new equatorial hothouse climate, even under the rains, the ground still smoldered, waiting for the longer, hotter dry seasons to return before again erupting into flame. All throughout the 2000s and 2010s, the situation worsened as temperatures back-filled into the new upper range set by the 1997 El Nino and then advanced still further. Now, human greenhouse gas emissions are again amplifying peak global temperatures as a Monster El Nino that threatens to be worse than the 1997 event is sweltering the globe. Now temperatures worldwide are hitting 1 to 1.2 C above 1880s averages. And now the Indonesia wildfires are growing from an annual nation-spanning disaster, to an epic conflagration that threatens to destabilize an entire region. 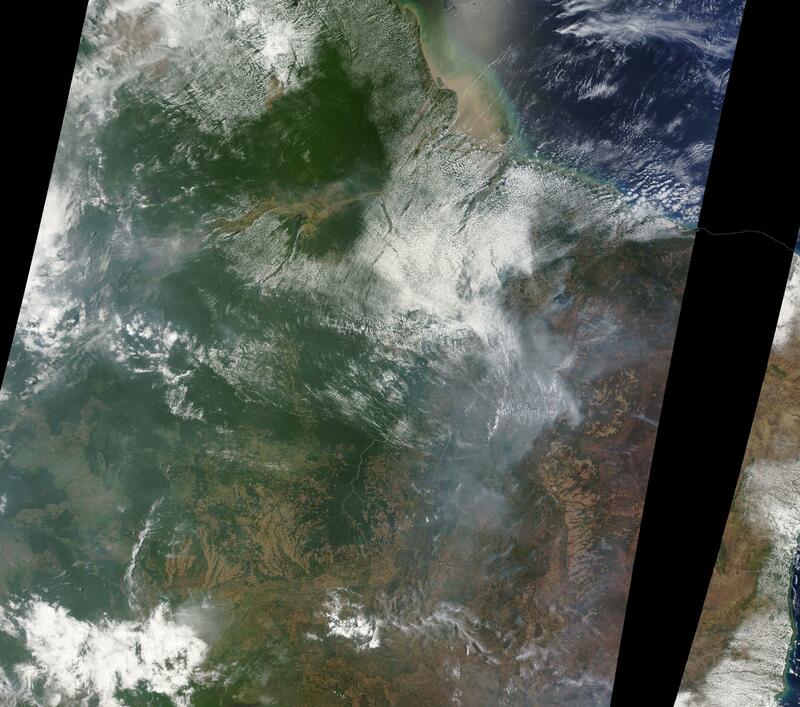 To say that the Indonesian fires this year have been bad may well be the understatement to end all understatements. As of mid October more than 100,000 individual fires had been reported. By late October, damages to the Indonesian economy were estimated to have reached 30 billion dollars (or more than six times the economic impact of the 1997 wildfires). More than 6,000 schools were closed as an international firefighting effort involving an army of 22,000 firefighters proved inadequate to contain the massive-country spanning blazes. An entire nation fell choking under black, gray, or toxic yellow skies. 500,000 people were reported sick. 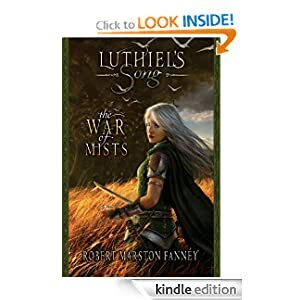 But not one person among the affected regions’ 43 million residents could pass a day without feeling the dark fingers of the peat smoke squeezing into their chest and lungs, doing untold future damage. 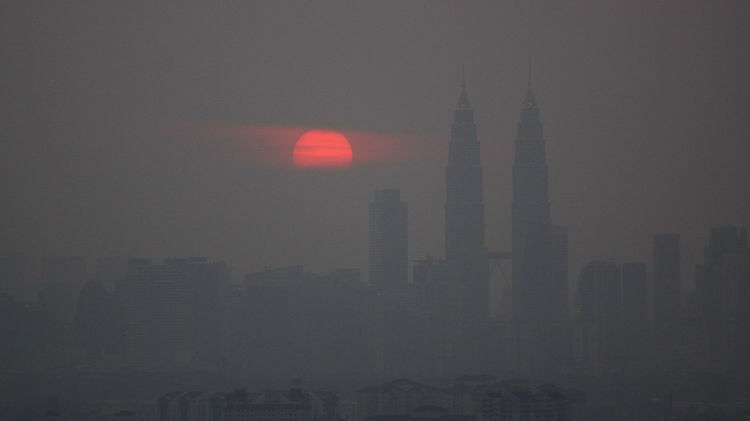 Thousands of miles away, places like Guam were forced to issue air quality alerts as the massive Indonesian smoke cloud was swept across vast swaths of ocean by storms or other weather systems. 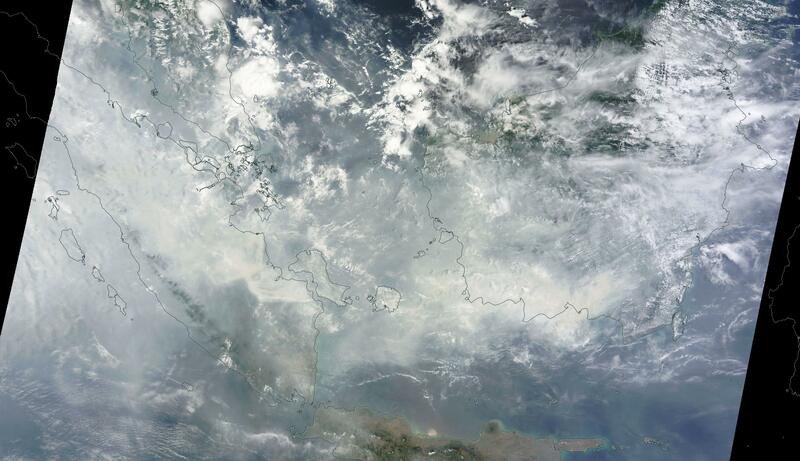 Indonesia’s peat fire smoke had now become a toxic export and neighboring nations were not at all happy at the vast, dark clouds spreading out from the burning lands. The situation has gotten so bad that Indonesia has now set in place mass evacuation plans for the hardest hit regions. The government has distributed 7,000 air purifiers as part of its ‘shelter in place’ program. But for those who simply cannot manage the stifling airs, authorities are planning for transport into hospitals and, if that doesn’t work, to military, hospital, and converted cruise vessels waiting off shore. Government actions, in this case, speak louder than the official words. What they may as well be saying is that, for an ever-growing number of Indonesian citizens, human-forced climate change and slash and burn agriculture has rendered the land uninhabitable. Sutopo Puro Nugroho, the spokesperson for the Meteorology, Climatology and Geophysics Agency neatly summed it up by stating: “This is a crime against humanity of extraordinary proportions…” The official then went on to state that now was not the time to point fingers. Now was the time to attempt to save lives. And he’s right. The time to point fingers was years and years ago, before this disaster began to fully unfold. Back then, in the late 20th Century we had a chance to address the endemic corruption of political and economic systems made to depend on dangerous and amoral industries. But at least now we can acknowledge what should have been said long ago — slash and burn agriculture, in this case, joins with the fossil fuel industry to form what could best be described as a global climate crimes syndicate. One whose dark fruits are now coming into an ugly ripeness over Indonesia. For this year, there’s no neat end in sight. This year, the rainy season may be delayed until at least December. 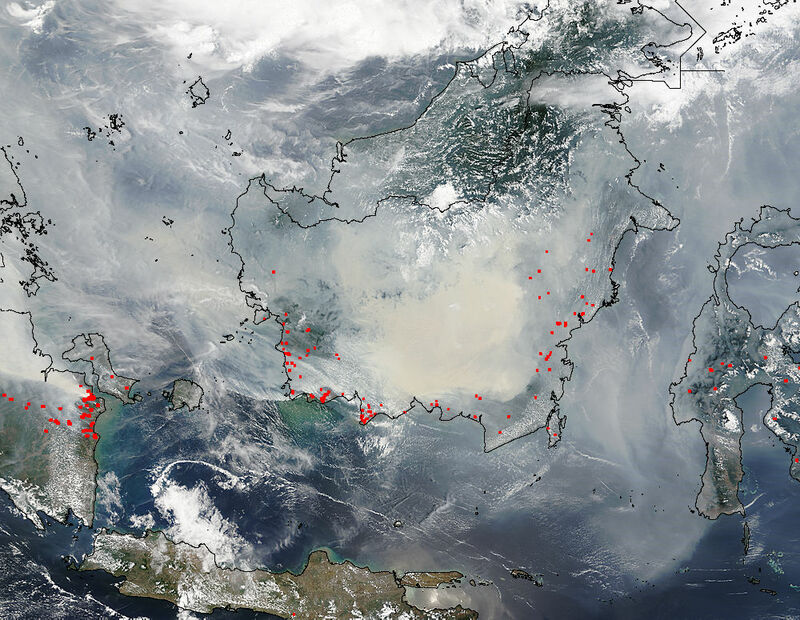 And until that time the hothouse stoked, slash and burn lit fires will continue to belch their awful fume, continue to stifle Indonesia’s inhabitants, continue to add more greenhouse gasses to an already sweltering atmosphere. That is, until the rains do come. And when they do, it’s just a six month wait for another ridiculous burning season, a 1-6 year wait for another new fire-worsening global temperature record, and a 7-20 year wait for another monster El Nino. In the end, the final wait until all of Indonesia’s peatlands are burned may be as little as 30-100 years. A once lush and forested land turning to ruin before our very eyes. Now this is scary. A tragic development you’d tend to see in a disaster movie screenplay and not in any typical meteorological record for any 36 hour period. But here we have it. Patricia, as of 36 hours ago, was a rather mild tropical storm churning through the human hothouse and El Nino warmed Eastern Pacific. The storm was predicted to make landfall in Western Mexico as a hurricane, then turn north into Texas, Louisiana and Mississippi — dumping extreme rains over a drought stricken region. But there was little hint as to what would happen next. Favorable atmospheric conditions and next to zero wind shear set the stage for strengthening. But the main driver was the hot ocean water which Patricia could tap as fuel for rapid intensification. For the entire region now features ocean surface temperatures in the range of 30 to 31 C (86 to 88 F) or about 2-3 degrees Celsius above average. 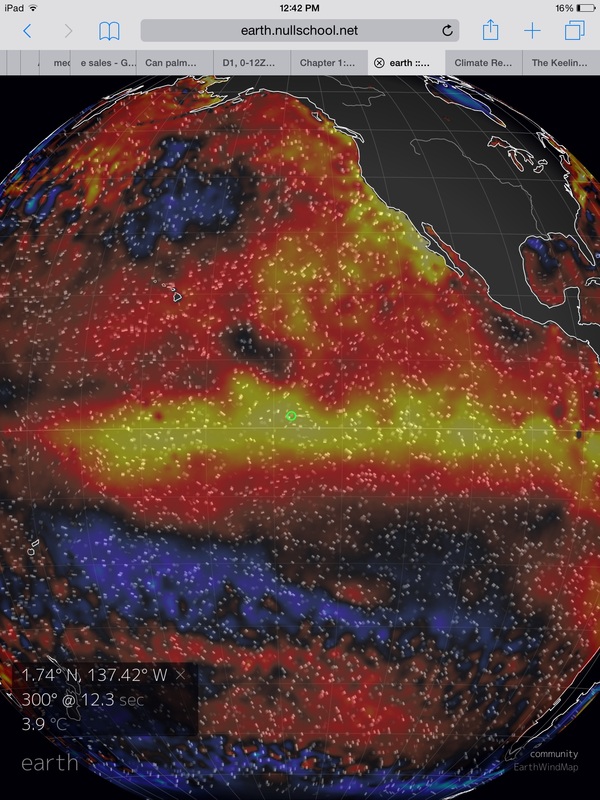 It’s heat fed by an El Nino that could be one of the top three strongest on record. 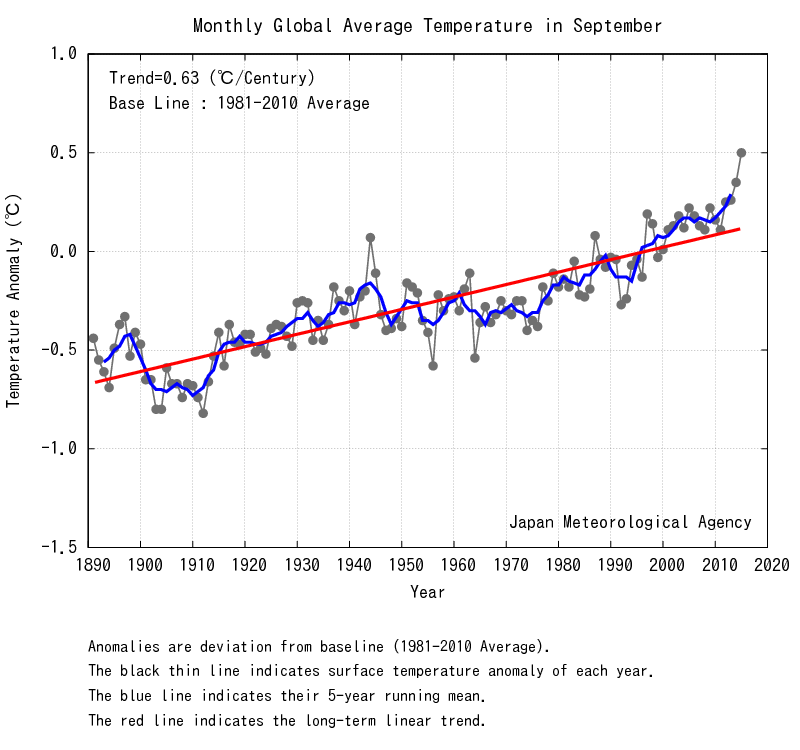 Heat further intensified by a human forced warming of the globe that has now hit about 1 C above 1880s levels. Heat that would allow Patricia to hit never before seen heights of storm force in a period of extraordinarily rapid intensification. Though weather models did forecast a rapid strengthening for Patricia, the kind of strengthening we ended up with was something freakish, historic and extraordinary. In a 36 hour period pressures plunged from a mild 990s mb storm to a system featuring an 880 mb minimum central pressure. This raging period of ocean-shattering intensification propelled Patricia to a dubious status of most intense storm ever recorded for the Western Hemisphere over centuries of barometric readings. Winds also rapidly strengthened — roaring up from 40 miles per hour to a current top intensity of 200 miles per hour. That’s 160 mph of wind intensification in a little more than 36 hours. Patricia’s winds intensified a whopping 109 mph during Thursday, rising from a tropical storm to a Category 4 hurricane. It was the fastest intensification ever recorded in the eastern Pacific Ocean, according to meteorologist Phil Klotzbach of Colorado State University (emphasis added). It was a never-before-seen pace of intensification. One that begs the question — how can we prepare for major storms if bombification starts to occur more rapidly than we can respond? At current intensity, the storm is now comparable to the monster western Pacific Storms — Haiyan (195 mph and 895 mb) and Tip (195 mph and 870 mb) — otherwise known as the strongest storms ever recorded. And all this fury now aimed at a well-populated swath from the Pacific Coast of Mexico through to the Gulf Coast of the United States. The potential for tragedy in this situation cannot be understated. A similar strength Hurricane Haiyan — also fueled by abnormally hot waters made hotter by human-forced warming — rendered tens of thousands homeless even as it resulted in the horrible loss of 6,300 souls. Patricia falls into this high-danger category for a few reasons. The first is that the storm is expected to maintain its extreme Category 5 intensity all the way through to landfall — which is predicted to occur within the next 10-12 hours. Abnormally intense ocean heat content along the path of Patricia, as seen in the graphic below, will continue to provide the powerful storm with fuel as it encroaches upon the Mexico Coast. As a result, a 15-30 mile swath of the Mexican coast may experience sustained winds near or in excess of 200 mph with gusts up to as high as 250 mph. That’s tornado intensity winds — with the ability to flatten homes or hurl cars through the air — but spread out over an area the size of a small state. Storm surges and related onshore waves are expected to be ‘catastrophic’ (the National Hurricane Center’s words). How catastrophic is unclear (no specific surge height predictions are given), but taking such extreme wind speeds and low pressures into account, we could certainly expect surges near and to the right side of the storm center to be in the range of 20-30 feet+. If Patricia slams into the coast at a direct angle, then impacts will be limited to a smaller area. But recent tracking has set Patricia on a more oblique path — which means numerous communities may see severe impacts if Patricia spends hours skirting the coast. In total, more than 7 million residents live in the coastal regions along the path of this storm with more than a million in the zone likely to be impacted by the most intense winds and storm surges (see more here). As Patricia begins to interact with the mountainous terrain near the coast, it should begin to weaken even as it dumps heavy rainfall predicted to be in excess of 20 inches over a broad region. Already, moisture and storm outflow from Patricia are being caught up in the Jet Stream and pulled north and eastward over Texas. By Sunday, the remnants of Patricia are expected to combine with a non-tropical cyclone in a kind of hybrid system which is predicted to, in turn, dump between 5 and 12 inches of rain over a wide section of Texas, Louisiana and Arkansas even as it lashes coastal regions with 60+ mph winds. This storm will provide yet one more weather whiplash to a region that experienced severe flooding this past Winter and Spring only to be replaced by severe flash drought conditions and extreme wildfire outbreaks during late Summer and early Fall. Patricia’s expected flooding rains will begin what is predicted to be an extremely wet Winter for the region — providing no relief from the highly varied conditions that have impacted this area for some time now. The kind of extreme weather variation that scientists warned was also a potential upshot of human-forced climate change. And, in this case, a record strength storm fueled by a near record El Nino, forming in a record hot world, and feeding on record hot Pacific Ocean waters is the delivery mechanism for the predicted switch. UPDATE: Patricia is now in the process of making landfall about 20-30 miles to the west of Manzanilla, Mexico. According to the latest advisory from the National Hurricane Center, maximum sustained winds have fallen slightly to a still ridiculous 190 mph even as the minimum central pressure has backed off to around 900 mb. Such an intensity still likely puts it in the range of strongest landfalling storms in North America after the Labor Day Hurricane (892 mb). Thoughts and prayers go out to all in the path of this monster. Please stay safe! We’ve talked quite a bit about the Arctic Methane Monster — the potential that a rapidly warming Arctic will force the release of disproportionately large volumes of methane from organic material locked in permafrost and in frozen sea bed hydrates composing volumes of this powerful greenhouse gas large enough to significantly increase the pace of human-forced global warming. But if we consider the globe as a whole, the Arctic isn’t the only place where large methane stores lurk — laying in wait for the heat we’ve already added to the world’s oceans and atmosphere to trigger their release. And a new study out of the University of Washington provides yet another indication that the continental shelf off Oregon and Washington may be one of many emerging methane release hot spots. For all around the world, and beneath the broad, blue expanse of the world’s seas, rest billions and billions of tons of frozen methane hydrate. A kind of methane and ice combination, frozen hydrate is one of the world’s most effective natural methods of trapping and sequestering carbon. Over long ages, organic material at the bottom of the oceans decompose into hydrocarbons, often breaking down into methane gas. At high pressure and low temperature, this methane gas can be locked away in a frozen water-ice hydrate lattice, which is then often buried beneath the sea bed where it can safely remain for thousands or even millions of years. Most of these deposits lay well beneath the sea bed or at extreme ocean depths of one mile or greater. And so far, human forced warming hasn’t been great enough to risk the destabilization of most of these deep ocean carbon stores. But some hydrate deposits rest in the shallower waters of continental slope systems and at depths where current warming may now be causing them to destabilize. Enter a new study by University of Washington scientists which found “an unusually high number of bubble plumes at the depth where methane hydrate would decompose if seawater has warmed.” The scientists concluded that these bubble plumes were likely evidence of methane hydrate destabilization due to a human forced warming of the water column in the range of about 500 meters of depth. The warm waters, ironically, come from a region off Siberia where the deep waters have, over recent decades, been heated to unprecedented temperatures. These waters have, in turn, through ocean current exchange, circulated to the off-shore region of Washington and Oregon where they appear to have gone to work destabilizing methane hydrate in the continental slope zone. A paper published during 2014 hypothesized that these warm waters would have an impact on hydrates. And the new paper is the first potential confirmation of these earlier predictions. In total about 168 methane plumes are now observed to be bubbling out of the sea bed off the Washington and Oregon coasts. Of these, 14 are located in the 500 meter depth range where ocean warming has pushed temperatures to levels at which hydrate could begin to destabilize. 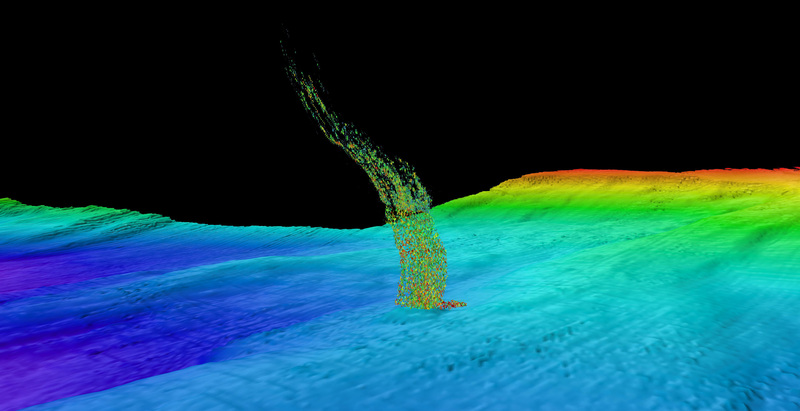 University of Washington researchers noted that the number of plumes at this depth range was disproportionately high, which also served as an indirect indicator that human heating may be causing this methane to release. Most methane released at this depth never reaches the atmosphere. Instead, it either oxidizes to CO2 in the water column or is converted by ocean bacteria. That said, expanding zones of methane release can rob the surrounding ocean of vital oxygen even as it can saturate the water column with carbon — increasing ocean acidification and reducing the local ocean’s ability to draw carbon out of the atmosphere. Such a response can indirectly increase the volume of heat trapping gasses in the atmosphere by reducing the overall rate of ocean carbon uptake. In more extreme cases, methane bubbles reach the surface where they then vent directly into the atmosphere, proportionately adding to the human-produced greenhouse gasses that have already put the world into a regime of rapid warming. It has been hypothesized that large methane releases from ocean hydrate stores contributed to past hothouse warming events and related mass extinctions like the Permian and the PETM (See A Deadly Climb From Glaciation to Hothouse). But the more immediate consequences of smaller scale releases are related to declining ocean health. Marine microbes convert the methane into carbon dioxide, producing lower-oxygen, more-acidic conditions in the deeper offshore water, which eventually wells up along the coast and surges into coastal waterways. “Current environmental changes in Washington and Oregon are already impacting local biology and fisheries, and these changes would be amplified by the further release of methane,” Johnson said. Instances of mass sea life die-off have already occurred at a very high frequency off the Washington and Oregon Coasts. And many of these instances have been associated with a combination of low oxygen content in the near and off shore waters, increasing ocean acidification, increasing dangerous algae blooms, and an overall warming ocean system. It’s important to note that ocean acidification, though often cited in the media, is just one of many threats to ocean life and health. In many cases, low oxygen dead zones and large microbial blooms can be even more deadly. And in the most extreme low oxygen regions, the water column can start to fill up with deadly hydrogen sulfide gas — a toxic substance that, at high enough concentrations, kills off pretty much all oxygen-based life (See Hydrogen Sulfide in the World’s Warming Oceans). During recent years, mass sea life deaths have been linked to a ‘hot blob’ forming in nearby waters (See Mass Whale Death in Northeast Pacific — Hot Blob’s Record Algae Bloom to Blame?). 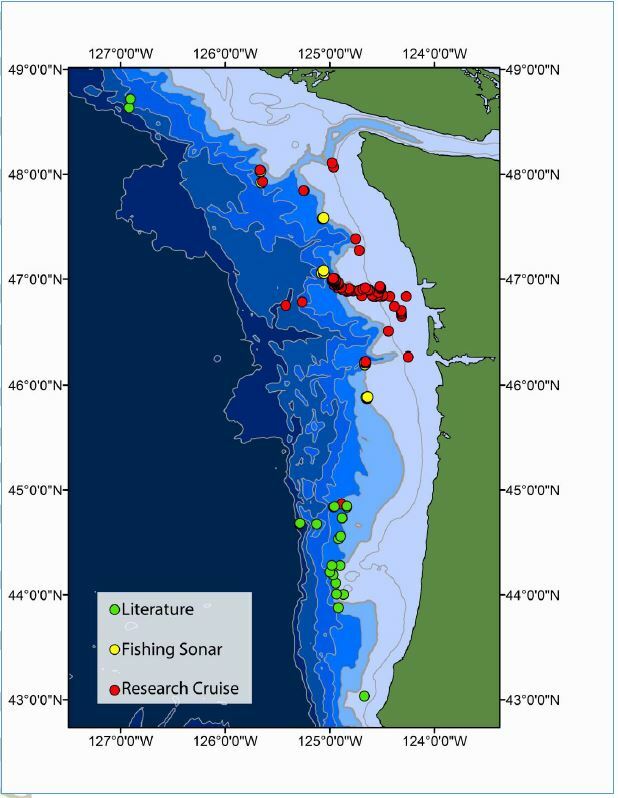 However, indicators of low oxygen in the waters near Washington and Oregon have been growing in frequency since the early 2000s. Though the paper does not state this explicitly — increasing rates of methane release in the off-shore waters due to hydrate destabilization may already be contributing to declining ocean health in the region. A final risk associated with methane hydrate destabilization in the continental slope zone is an increased prevalence of potential slope collapse. As methane hydrate releases, it can deform the sea bed structures within slope systems. Such systems become less stable, increasing the potential for large underwater landslides. Not only could these large landslides displace significant volumes of water or even set off tsunamis, slope collapse events also risk uncovering and exposing more hydrate systems to the warming ocean in a kind of amplifying feedback. In context, the total volume of methane being released into the off-shore environment is currently estimated to be about 0.1 million metric tons each year. That’s about the same rate of hydrocarbon release seen from the Deepwater Horizon blowout. A locally large release but still rather small in size compared to the whopping 10+ billion tons of carbon being dumped into the atmosphere each year through human fossil fuel burning. However, this release is widespread, uncontrolled, un-cappable and, if scientists are correct in their indications of a human warming influence, likely to continue to increase as the oceans warm further. 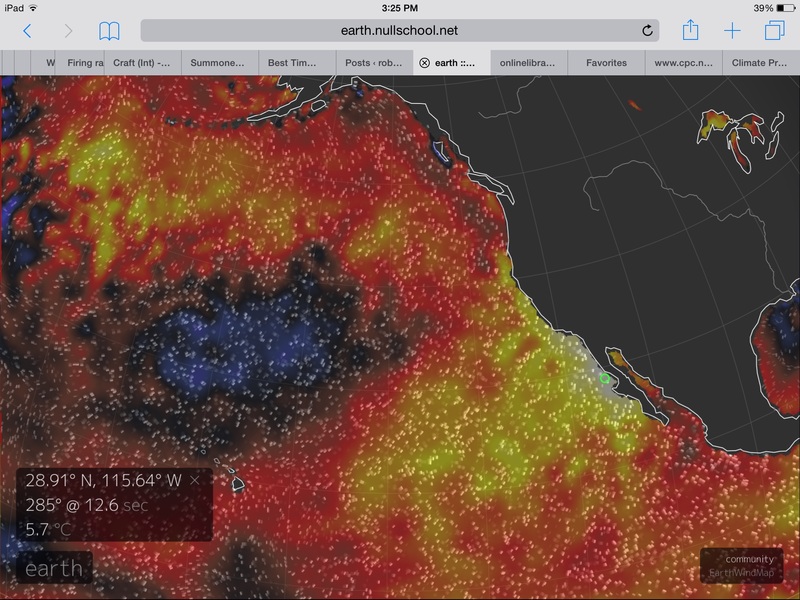 Mass Whale Death in Northeast Pacific — Hot Blob’s Record Algae Bloom to Blame? From end 2014 through Fall of 2015 global sea levels surged. Building heat hitting +1 C above 1880s averages in the atmosphere-ocean system continued to set off a range of what appear to be ramping impacts. Thermal expansion grew more dramatic as oceans continued to heat up during what may be a record El Nino year. Rates of land ice melt continued to increase — providing a greater and greater fraction of overall global sea level rise. And global ocean currents showed signs of a melt-spurred change — which resulted in an uneven distribution of this overall rise. During that less than one year time, seas rose by fully 1 centimeter. That’s three times the ‘normal’ rate that’s been roughly ongoing since the early 1990s. A big bump that’s now part of a three-and-a-half-year, 3-centimeter surge. One more sign that global sea level rise is starting to really ramp up. This big, one-centimeter, jump topped the previous AVISO graph, which went up to 8 centimeters, forcing the measure to generate a new graph with a 9 centimeter top like. In other words, ‘we’re gonna need a bigger graph’ (See the old, smaller, graph here). Unfortunately, with some of the world’s top scientists predicting the potential for an exponentially increasing rate of sea level rise through this Century, it appears that ‘we’re gonna need a bigger graph’ may well become the scientific rallying cry of the age. This year’s seemingly-staggering, 1 centimeter and counting, jump in sea level in less than one year, if maintained over the course of a century would result in a more than 1 meter global rise. Sadly, many new studies on the rate of glacier destabilization in Antarctica and Greenland hint that such a significant jump in sea level is not only likely, but may even be significantly exceeded under business as usual or even a moderately curtailed rate of fossil fuel burning. A new study led by former NASA GISS head Dr. James Hansen points to the possibility of as much as 3 meters of sea level rise by mid Century and 7 meters or more of sea level rise by end Century even if the global economy somewhat steps off its current high trajectory of fossil fuel burning. Such massive rates of sea level rise would clearly be catastrophic. In such cases, we’d start to see these kinds of exponential increases really begin to ramp up over the next 10, 20, and 30 years. And, given the rather large bumps we’re seeing in the AVISO measure for the past 3 and a half years, it’s possible we’re at the start of one of these potential step changes. 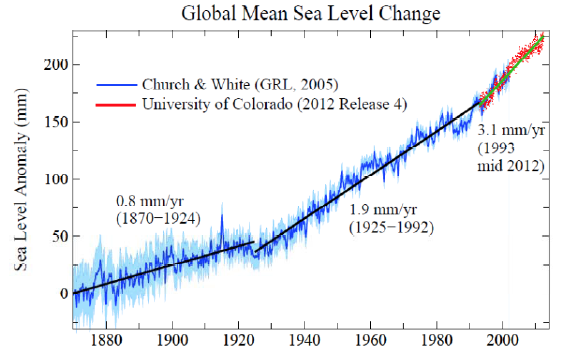 Global Sea Level Rise Going Exponential?